DesktopX 3.5 and begin to study Windows Vista. We must go with the times! I will not tell you about a crazy days in my country and about a reasons that have disturbed me to finish this project earlier. The gadget must be on the button center of your screen now. A minor bug with shortcut names fixed too. You will find the SD Installer in the zip file that will install SD Desktop on your computer. 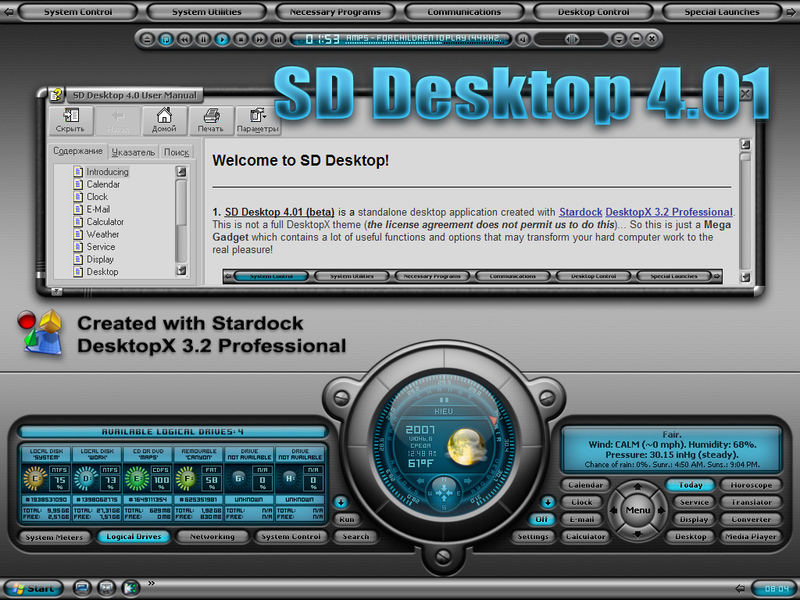 SD Wallpaper, SD Logon, the necessary fonts, illustrated User Manual and uninstaller are included into the package. * To open the User Manual: press the "Settings" button, choose "View" in the "User Manual" Combo Box and press "OK". This was definately worth the wait! There really is no reason to download anything else! Thank you very much. It would have been nice if the gadget could be moved to accommodate high screen resolutions. Otherwise this is an incredible piece of work. Great job. It looks great, but I have one glitch. The menu on the right side drops down and covers the menu control, so that I cant change from one to another without closing it down and restarting it again.It blocks out the calandar,weather, and horoscope buttons so they cant be changed without restarting. This is amazing! It's so beautiful! Outstanding work, Vad_M. That's it for now. Everything else seems to be working fine and I'm having a blast with this gadget. It's extremely powerful, functional, and such eye candy! I don't think it's supposed to look like this: I'm a link is it? No problem! I'll write a simple code which will calculate the "zero" position for each of objects and move them on your Screens. No problem here - keep up the excellent designs! I believe your work to be amongst the best - thank you! where can I get the update? the link points to a "file not found"
Finally the update is posted. It Looks great ,WORKS GREAT, its perfect, and you are the MASTER! Hi Vad. This update works fine in Windows Vista. Excellent work!! !